On April 5-6, 2013 the Midwest Institute for International/Intercultural Education (MIIIE) held its 20th annual conference at Lorain County Community College in Elyria, OH. The conference brought together about 150 community college educators from 41 colleges for sessions that focused on a range of curricular and programmatic efforts. Many of the presenters had previously participated in MIIIE summer workshops and at the conference presented on the courses and activities they had developed. Iona Joseph Abraham from Lorain County Community College and Gary Hauck from Montcalm Community College sharing their experiences in teaching about cooperation and conflict in geography and English composition. Suzanne Ondrus from Lakeland Community College and Young Woon Ko from Lorain County Community College teaching peacebuilding through African literature and Buddhist-Christian dialogue. Jeff Leigh from University of Wisconsin-Marathon County providing analysis of the Arab uprisings. Neeta Chandra of Cuyahoga Community College and Thomas Schurino from Muskegon Community College discussing the role women in the Middle East and Iran. A number of sessions focused on study abroad efforts for students and faculty including programs that MIIIE is developing in China. MIIIE is an active and well-regarded international education consortium representing faculty from over 100 community colleges. It hosts summer professional development workshops, sponsors Fulbright travel programs for faculty, and has applied for and received Title VI grants for global education. 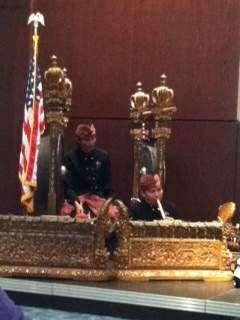 The conference on Friday night included a performance by Cudamani, a gamelon performance group from Bali.